There are times when I need inspiration or a pick me up — and thankfully, I’ve “favorited” a lot of links that have been passed on to me in the past and I can come back to them when necessary. And I don’t know why it is, perhaps just that it’s Monday, but I needed a little extra this morning to get me going. So I went through and went back to once again watch a short video that was made about Jeffrey Wright, a physics teacher at Louisville Male Traditional School in Louisville. 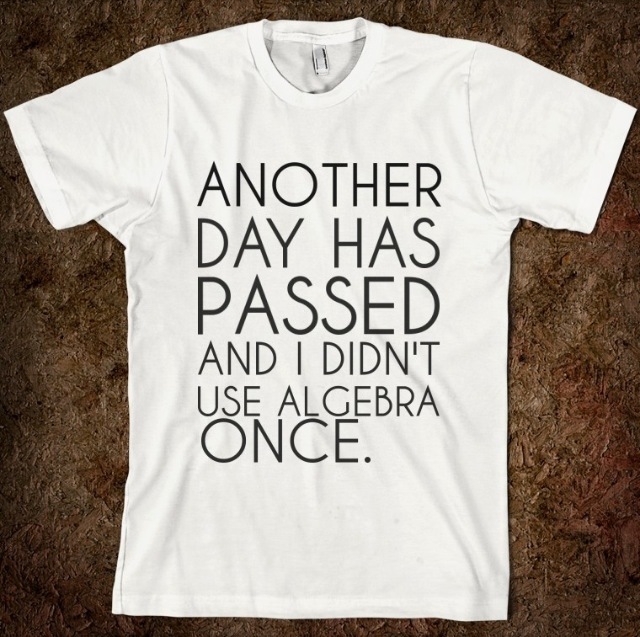 Admittedly, I’m not a physics guy — I’m not a math or science guy whatsoever — and as much as I find humor in a shirt like the one below, I do know that those who are involved in math or science are making a heck of a lot more money than I am. I will say this, though. I think I’d LOVE to be in Mr. Wright’s physics class. And, for that matter, I would love to also hang with Conkle — what a talent in the making. This entry was posted in daily life of a teacher and tagged algebra, Jeffrey Wright, NY Times, physics, Tara Parker-Pope, Zach Conkle. Bookmark the permalink.